How do I print multiple labels (batch print) at once using Unify Desktop? If you are shipping multiple orders (in a batch) and each order has different shipping parameters (Service, package type, weights), you can select “Save Shipment” for each order one at a time. This will save the shipping parameters for the current shipment and then you can move on to create a shipment for the next order. When all of the orders are selected and marked Ready To Ship, click Generate Label to print out labels for each of the orders. If all orders have the same shipping parameters, they can all be shipped at once by clicking the Generate Label button. A label for each order will be printed. 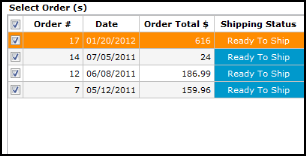 After labels are printed the order status will be changed to Shipped and will appear as shown below, in the Inbox tab. Packing slips and pick lists can also be printed from this area as well as from the Inbox tab.